Lots of developments have happened to the process of moviegoing since the late 1950s, not all of them positive. One negative aspect is the loss of the serial- an indispensable part of the whole filmic experience in the days before special effects came to dominate what used to be known as the plot. Originally conceived in the 1910s, even then the serial as a type of product was often sidelined in terms of having a limited budget and lesser personnel with which to weave its magic. Though this sorry state of affairs continued into the sound era, one serial that did not suffer this ignominy was Universal’s splendid Flash Gordon (1936) and its two successors, Flash Gordon’s Trip To Mars(1938) and Flash Gordon Conquers The Universe (1940). Indeed, the first of these serials had a huge budget for the time of $350,000- one possible reason for its ability to capture the imagination over 70 years since its first appearance. The Flash Gordon Serials 1936-1940 is, rather surprisingly, the first such study of this classic trio of adventures which themselves ironically grew out of the success of another Alex Raymond creation, Buck Rogers. ‘One of the true milestones of the newspaper comics market’ (p.3), Flash Gordon belongs to those sound serials which, according to Kinnard, Crnkovich and Vitone, only really appealed to a juvenile audience compared to the silent serials whose appeal was much more widespread (p.6). This is an interesting point, indicating perhaps a shift from an adult audience’s mature acceptance of the thriller-orientated silent to an aloof dismissal of the science-fiction dominated sound serial. The structure of The Flash Gordon Serials 1936-1940 is a very logical one, which makes navigation easy. Each of the Flash Gordon serials is dealt with in terms of a general overview before a chapter-by-chapter synopsis is followed by comments which mingle the authors’ views with extracts from interviews conducted with the major cast members. These comments sections start energetically but gradually run out of steam- whereas Chapter 3 balances a one page synopsis with an equally long commentary (pp. 44-48), Chapter 6 also receives a one page plot synopsis but only three and a half lines of commentary (pp.58-59). One solution would have been to balance out the anecdotes from Jean Rogers, Buster Crabbe et al, but the current approach does enable the later Chapters of the 1936 serial to be quickly and easily digested. Thus, ‘the greatest movie serial ever made’ (p.85) occupies the first section of the book, which rightly gives credit not only to the first-rate performances of the cast but to the unsung people behind Flash Gordon’s production such as Clifford Vaughan, whose highly evocative music is a pure joy throughout each of the thirteen episodes. The rest of the book follows the pattern established for the first serial, again making great use of many superb photographs. Highly photogenic, all three serials yield a huge variety of still frames of the highest quality (see pages 41, 66, 75, 111 and 140 for just a few wonderful examples). Thus, with such a visual feast to contend with, the pages pass effortlessly, and the three original Flash Gordon serials are left behind. One very useful and interesting extra is the attention given (in Appendix I, pp.161-171) to the 1939 Buck Rogers serial which also starred Buster Crabbe.Appendix II (pp.172-194) features detailed comments and ‘filmographies for fifty of the most prominent actors, producers, directors, writers and technicians involved in making the Flash Gordon serials’ (p.172), and makes an interesting point (which I fully endorse) that Buster Crabbe was ‘a positive role model for generations of American youth’ (p.175). We could do with adopting his kind of values today. Finally, Appendix Three (pp.195-198) details the main two remakes of Flash Gordon, being the 1954 television series and the 1980 film. The latter is dismissed as ‘a jokey spoof contemptuous of its source’ (p.198) by Kinnard, Crnkovich and Vitone, which marks an appalling lack of appreciation for several aspects of the movie itself. Firstly, Mike Hodges’ film brought the character of Flash Gordon into the public eye once more, thereby sparking an interest in the very serials the authors acclaim. Secondly, the film boasts stunning mise-en-scene which vividly brings Alex Raymond’s world to life (as did the original serials, but this time in dazzling colour). Finally, the score does not feature an ‘inappropriate music score by the rock group Queen’ (p.198) but does feature possibly the highlight of Queen’s musical career- the accompaniment to the Hawkmen’s attack on the Rocket Ship Ajax is perfectly geared to the film’s pace and creates a highlight of the film. By any standards, when the film is good it is outstanding- it can never be satisfactorily categorised as a ‘major disappointment’ (ibid. ), but, if one is cocooned in the 1936-1940 serial episodes, a longer colour film may feel like a garish travesty. It should, though, be the role of the critic sympathetic to the many guises of such a versatile character as Flash Gordon to look beyond superficialities and to realise that, ultimately, the 1980 film brought the character back into the zeitgeist once again. 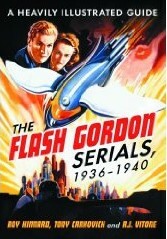 Despite its modest appearance, The Flash Gordon Serials 1936-1940 is an excellent and long overdue account of three serials which influenced audiences then and continue to do so today (compare the many wipe transitions and scrolling text found in the Star Wars saga with those used in the Flash Gordon serials). Even now, the character of Flash Gordon has been brought to a 21st Century audience in another American television series which, I hope, will again spark an interest in the characters’ earlier incarnations. If there is any significant criticism to be made against Kinnard, Crnkovich and Vitone’s book it is that there is no consideration of the marketing of the serials nor illustrative material (lobby cards, for example) to reflect this. This author certainly has several examples he could have loaned for the purposes of illustration! 'The Flash Gordon Serials 1936-1940' is published by McFarland & Company Ltd.